Mouser Electronics announces a global distribution agreement with Marvell Semiconductor, a provider of storage, processing, networking, security and connectivity semiconductor solutions. Mouser will distribute Marvell industry-leading Fast Ethernet and Alaska Gigabit Ethernet PHY transceivers. VadaTech, a leading manufacturer of integrated systems, embedded boards, enabling software and application-ready platforms, announces the VTX991. The VTX991 is a single slot 6U VPX chassis for board bring-up and testing of 6U VPX modules. ATENA (Advanced Testing Emulator for Nanosatellite Arm) simplifies simulations of satellite performance, generally carried out through complex numerical analysis and tests of hardware, software, navigation and control algorithms, which usually return results difficult to interpret. NEXT Future Transportation Inc. the world's only modular electric vehicle solutions provider, announced a groundbreaking automated logistics solution for Smart & Connected Cities. The NSR-PG smart gripper is specifically intended for small robots and small parts. 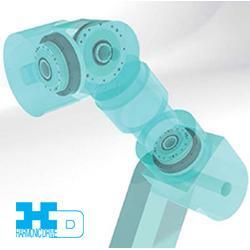 It is ideal for use with UR3, UR5 and UR10 collaborative robots for intricate part handling, measurement, sorting and assembly. Pick-it, Intek, and Zivid to demonstrate the latest in robotics and machine vision solutions during OBF where Barack Obama will speak. We're pleased to announce that our latest release, KINGSTAR 3.5, is now available. KINGSTAR 3.5 includes powerful new features for both Soft Motion and EtherCAT, as well as updates, bug fixes, and support for new hardware. We're most excited about two new features in KINGSTAR Soft Motion. Soft Motion now integrates LogicLab and PLC Runtime powered by AXEL into KINGSTAR, so you can further simplify application design and development. In addition, we've extended support to allow KINGSTAR EtherCAT applications to run on KINGSTAR Motion Runtimes. Applications developed with KINGSTAR EtherCAT can now be easily upgraded to KINGSTAR Motion so developers can use the built-in motion functionality.